Polluted stormwater runoff is the #1 pollution source around Puget Sound. Businesses are helping mitigate that pollution. Spill kit demonstration. Photo Credit: Enviroissues. During heavy rainfall, water picks up pollutants from impervious surfaces like roads and parking lots. This water flows directly from storm drains to our waterways, harming the health of communities and aquatic life. Industries and municipalities are major originators of the oils, fuels, metals and other pollutants that ultimately contaminate Puget Sound waters. But some businesses want to change that and ECOSS provides the tools to do so. In 2018, we visited over 1,400 businesses, delivered nearly 650 spill kits and provided spill training and prevention plans in more than 30 Puget Sound cities and counties. Spill kits help businesses keep spilled materials from reaching storm drains in streets, alleys and parking lots. Outreach is personalized to each business. Photo Credit: Kelvin Kong / ECOSS. And our offerings for stormwater management workshops and trainings nearly doubled in 2018. Seven industry-focused workshops reached almost 100 individuals and over 80 companies. And 18 municipal-focused workshops trained 625 municipal staff across 37 jurisdictions, agencies and businesses. These workshops help attendees understand permitting requirements, improve stormwater management practices and protect local waters and watersheds. Help us expand our business outreach for greener businesses, cleaner waters and healthier communities! Blue bins are now practically synonymous with recycling. Many know that soda cans and old newspapers go into recycling bins, destined to become other useful products. But what about old electronics? Emptied propane tanks? Scrap metal leftover from a home project? These and many other materials can be recycled too, though often not as easily. Since 2016, ECOSS has worked with the City of Kent to help King County residents recycle less-common items such as refrigerators, concrete, tires and mattresses. Cars lining up to drop off recyclable items and materials for a Kent recycling event. Photo Credit: Tony Donati. Kent recycling event. Photo Credit: Tony Donati. From lawnmowers to microwaves, Kent recycling events help people be environmentally-responsible. Photo Credit: Tony Donati. In 2018, we helped with three free community recycling events, which collectively welcomed over 4,000 vehicles full of recyclables. The events altogether collected over 3,000 toilets, mattresses and other individual items plus over 300 tons of material like scrap metal, bulky wood debris and concrete! ECOSS strives to make environmentally sustainable practices accessible to all. Many people are interested in reducing their environmental impact. We empower people to act on those interests and to let others know how they can make a difference, too. Allan Kafley, Multicultural Outreach Manager, brought the Bhutanese community to the Duwamish Hill Preserve to connect and give back to their environment. Check out the video to hear how the community values these volunteering events. Tukwila councilmember De’Sean Quinn came out with his family to restore habitat at the Duwamish Hill Preserve as part of Duwamish Alive! Check out the video to hear why volunteering events are so important. 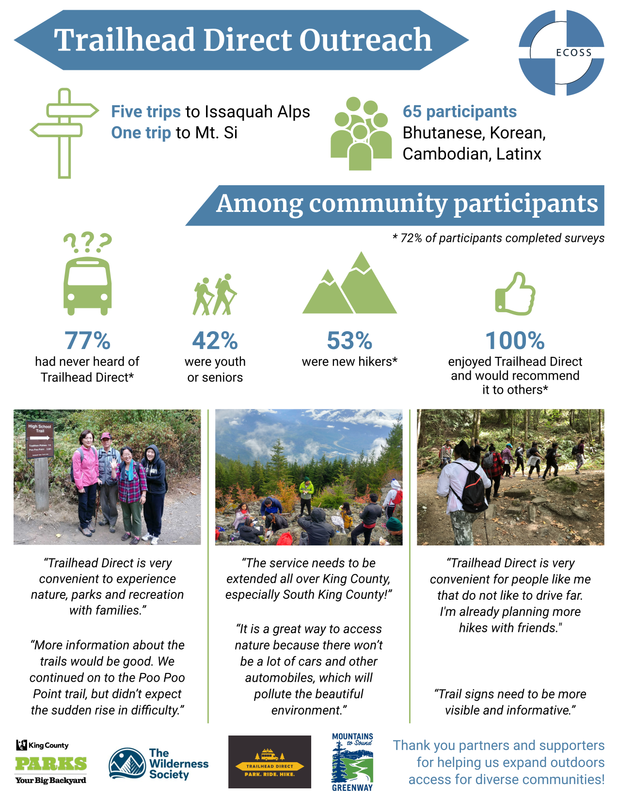 ECOSS and Mountains to Sound Greenway Trust partnered to provide environmental education, cultural history and habitat restoration opportunities for diverse communities. Bhutanese community comes alive at Duwamish Alive! Autumn is a great time for habitat restoration around Puget Sound. The start of the rainy season means softer soils, perfect for invasive weed removal and native vegetation planting. Although cloudy skies may not be the most exciting outdoors weather, that could not dampen the enthusiasm of nearly 40 volunteers who showed up at the Duwamish Hill Preserve! Gathered around the site’s Seasonal Round, volunteers learned about the history of the preserve, the Salish peoples and the cultural and ecological significance of the plants around them. ECOSS Multicultural Outreach Manager Allan Kafley talking about how indigenous tribes were connected to native plants and how local wildlife benefits. Photo Credit: Sam Le. Then it was time to put on gloves and grab the shovels. With twice as many volunteers as expected, the group quickly dug out invasive weeds, replaced them with native shrubs and helped protect this unique ecosystem and cultural site! Adjacent to the Duwamish River, this site — like others being restored within the Duwamish Alive Coalition — also supports salmon by reducing pollution in the river. Removing invasive weeds by the armful. Photo Credit: Sam Le. Restoration tools for the day. Photo Credit: Sam Le. Digging back invasive reed canarygrass. Photo Credit: Sam Le. Proud habitat restorers with the Tall Oregon grape they planted. This plant can be found natively throughout the Pacific Northwest. Photo Credit: Sam Le. Native planting is best done in pairs. Photo Credit: Sam Le. A long-toed salamander wandering the restoration site. Photo Credit: Sam Le. Each overturned pot represents a newly planted native plant. Photo Credit: Sam Le. Group photo of the volunteers. Almost 40 in total! Photo Credit: Sam Le. Habitat restoration volunteering is a great way to build connections with the environment and with one’s community. Not much can compare to the feeling of encountering the animals that you are working to protect while restoring habitat. The New Arrivals program promotes access to these and other experiences for immigrants and refugees.